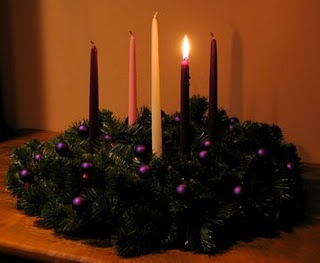 note: This post was scheduled yesterday, the first Sunday in Advent. Due to unforeseen computer glitches, it didn't post. The sentiment remains the same. Advent, the time of waiting and expectancy. It is one of my favorite liturgical seasons. It marks the beginning of the new liturgical year. Happy New Year! No champagne needed. We don't put up our Christmas tree for a few more weeks. As young parents our goal was two fold. One it allowed us the opportunity to celebrate and share with our children the holy season of Advent, and it also allowed us to keep the "Gimme!" frenzy under control with four small children. For years we used a book that was written for young families to pray with our Advent wreath. They became so attached to this little book, they were older teenagers before we were able to get them to let it go. They were a bit old for "be kind to your brother" for an Advent reflection. We use more adult materials now. It has become a well loved tradition in our family. "Each year, God asks us to shed one more coat of awareness, one more dream state and come alive to the vision of God’s plan for each of us and the world-at-large. "The older we get, the harder this is to do. As children we had a sense of wonder. Our eyes were wide open and drinking in the fascinating gifts we beheld…Our thirsty souls could not have enough of the wonders of creation. "The natural gift of wonder God gave us as children was meant to be kept alive.…Instead we let wonder go to sleep. We entered the typical dream state of most humans. "…Psychology says, ‘Let go.’ Spirituality says, ‘Wake up.’ In both cases there is a withdrawal from the busyness of daily life (our dream state) and a waking up to the subconscious and spiritual depths of ourselves." Advent blessings to you, faithful reader. May this time of waiting, of looking for light in the darkness, of the coming of the Incarnation richly bless you in the days approaching Christmas. This is so beautiful. I wish the same for you. Thank you for sharing this. Well said dear woman. AMEN and the same good wishes to you and yours. Thank you for posting this. I really enjoyed it. So much like my life lately... being in the dark, and waiting... Thanks for the sentiment.